Coupons have never been more popular than they are today. The proof is in the reality TV shows that are dedicated to the illustrate their use… to the EXTREME! 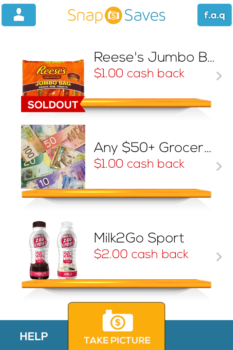 SnapSaves adds to this craze by giving you digital coupons that earn you some cash back and save you from fiddling with paper while you stand at the checkout. New offers appear on SnapSaves every Wednesday and are available until they expire or while quantities last. Additional deals also appear throughout the week. 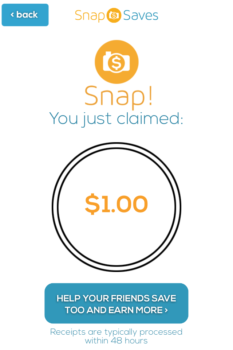 To redeem one of these offers you have to take a picture of your whole receipt (you can add sections if your receipt is long), select which offer(s) you’re redeeming with the receipt, then submit your receipt and it should be processed and credited to your SnapSaves account within 48 hours. Once you have $20 in your account you can have a cheque mailed to you. 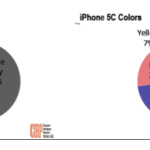 If you’ve been using Checkout51 this process will very familiar as the only differences between SnapSaves and Checkout51 are their deals and their colour palettes. I believe using SnapSaves will definitely payoff with little hassle. Although, I’ve only redeemed a dollar my experience thus far has been positive. I had no trouble photographing a very long receipt, and my receipt was processed and my account was credited in less than 24 hours over the weekend. 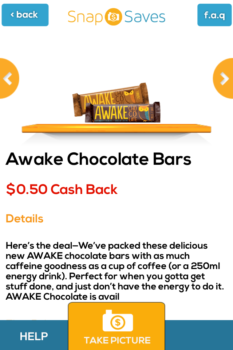 SnapsSaves and Checkout51 both have new deals on familiar products each week that will earn you some cash back. You can download both for free from the App Store. 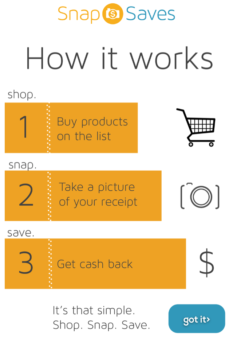 Then, tell us about your experience redeeming offers on either SnapSaves or Checkout51.